Cat-Gut Jim. 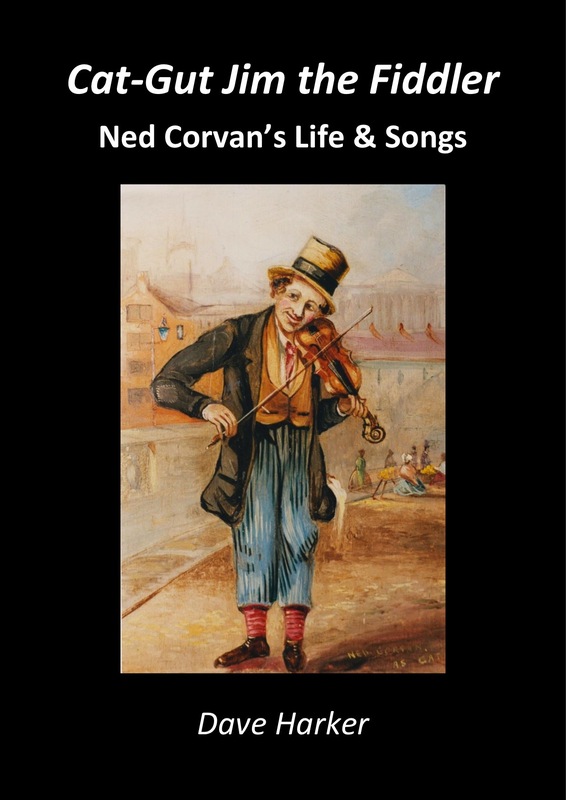 Ned Corvan’s Life & Times is a 208-page, A4, full-colour book about the man who became the first singing and song-writing star on Tyneside and for some distance beyond. Ned was the first professional North East singer / songwriter. He wrote songs that had resonance with working class people and that are still relevant today. He was a contemporary of Geordie Ridley (Blaydon Races) and Joe Wilson (Keep Your Feet Still Geordie Hinny) – and arguably the greatest singer/songwriter of the triumvirate. Ned was born in Liverpool to Irish parents Matthew and Margaret Corvin/Corvan in around 1827 but, just a few years later, the family moved to Newcastle to make a fresh start. But Matthew’s death in 1841 left Margaret struggling to bring up three children alone and, while still a young boy, Ned found work as a sail-maker to help out. His industrial career was short-lived. Instead, the lure of the stage prompted Ned to down tools and join Billy Purvis’s Victoria Theatre, where he wowed critics and audiences alike with his comic songs. Further success followed during tours of the region’s music halls and theatres and, at the height of his fame, Ned – by now married with children – moved his family to Sunderland. The couple actually married in North Shields in 1851 and lived in South Shields for a period, where Ned ran Corvan’s Music Hall for three years. It is believed the Corvans moved to the Covent Garden area of Sunderland in around 1856. Sunderland boasted several top music halls and theatres when Ned arrived in the town and, with his combined talents of music, art and violin playing, he topped the bill at several local venues – including Wear Music Hall in Drury Lane, the Theatre Royal in Bedford Street and the Lyceum Theatre in Lambton Street. While Ned’s act was very popular in Newcastle – he was in big demand at Balmbras Music Hall – he was equally popular in Sunderland, Hartlepool, County Durham and Gateshead. Ned, who died of tuberculosis of the larynx in 1865, wrote at least 120 songs and was celebrated from Scotland to Yorkshire for his comedy lyrics, funny tales, drawings and comedy characters. Anti-establishment to the last, one of Ned’s most popular comic numbers was The Queen Has Sent a Letter – about Queen Victoria sending a letter of sympathy after the 1862 Hartley pit disaster. He is even thought to have started the Hartlepool Monkey myth with his song Fishermen Killed the Monkey. The song provides the earliest mention of the Hartlepool hanging. Keith Gregson, author of Corvan – A Victorian Entertainer and his songs (Oxford: Kemble, 1983). 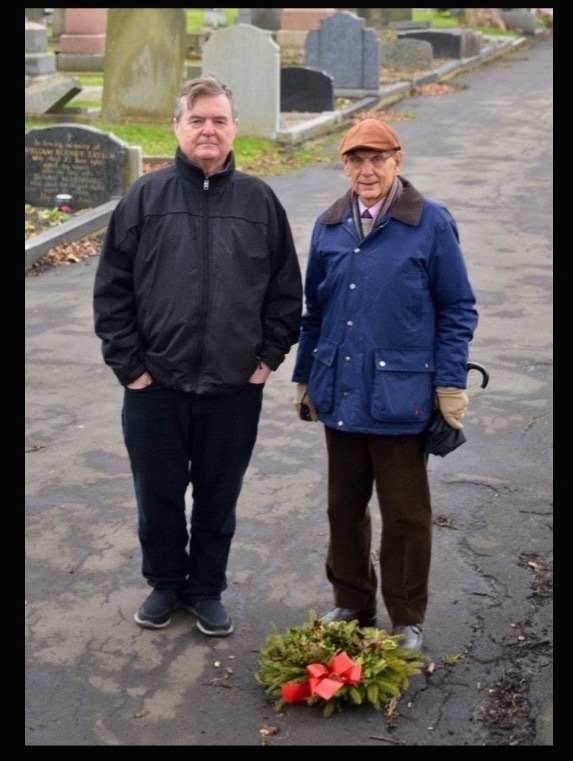 Dave Harker and Joseph Wilkes, Ned Corvan’s great-grandson, at Corvan’s unmarked grave under a crumbling tarmac path in St. Andrew’s Cemetery, Jesmond.